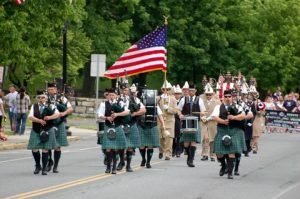 Established in 1976, the Berkshire Highlanders pipe band marches and plays from St. Patrick’s Day in March to Columbus Day in October in a splendid array of college graduations and alumni reunions, patriotic ceremonies, fund-raisers and benefits, Highland games and gatherings, fairs and firemen musters, and such one-time engagements as the inauguration ceremony for a Massachusetts governor. The band always welcomes new members. Whether you have played the pipes before or just wish to try, don’t hesitate to visit us at a practice or to contact us. Come and learn to play the Great Highland Bagpipes or the snare, tenor, or bass drum. At this time, we are in need of more pipers, so if you have an interest in learning or playing with us, please come to our practice Wednesday nights at 6:30 at Berkshire Community College!